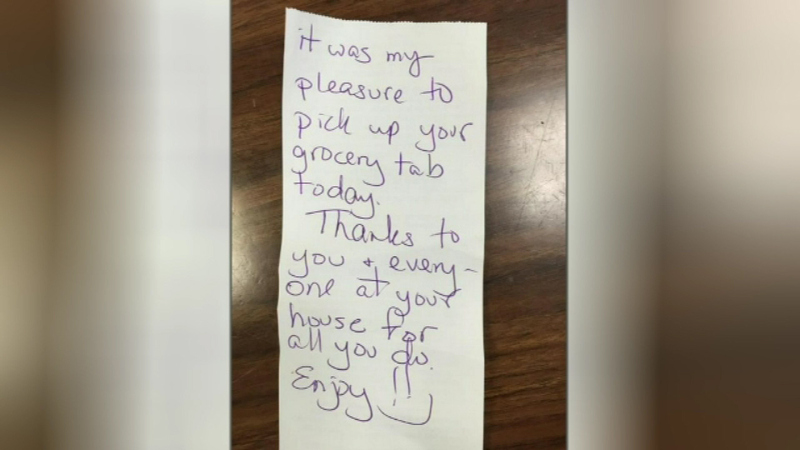 Some other firefighters later went to the store and found a note saying their groceries had been paid for. BOLINGBROOK, Ill. (WLS) -- Two Bolingbrook firefighters were doing some grocery shopping for the firehouse Wednesday night when they had to respond to an ambulance call. They left their shopping cart behind at the nearby Meijer store after receiving the call. "Whoever you are, he or she, we'd like to invite you over for dinner, or lunch, you guys gotta stop by and let us know who it was," said Dave Zelinski, a firefighter/paramedic. He says the fact that someone in the community had done this was very humbling.